Read Infomocracy, the first book in Campbell Award finalist Malka Older's groundbreaking cyberpunk political thriller series The Centenal Cycle and the novel NPR called "Kinetic and gripping." - The book The Huffington Post called "one of the greatest literary debuts in recent history"
- One of Kirkus' "Best Fiction of 2016"
- One of The Washington Post's "Best Science Fiction and Fantasy of 2016"
- One of Book Riot's "Best Books of 2016 So Far"
MALKA OLDER is a writer, humanitarian worker, and Ph.D. candidate at the Centre de Sociologie des Organisations studying governance and disasters. 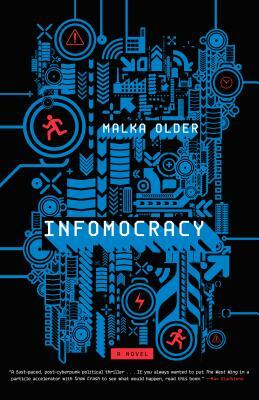 Named Senior Fellow for Technology and Risk at the Carnegie Council for Ethics in International Affairs for 2015, she has more than eight years of experience in humanitarian aid and development, and has responded to complex emergencies and natural disasters in Uganda, Darfur, Indonesia, Japan, and Mali.Infomocracy is Malka Older's first novel.